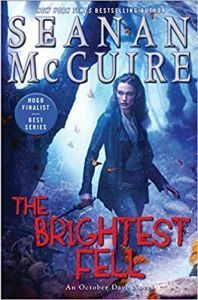 You are here: Home » MEDIA » Books » The Brightest Fell (October Daye book 13) by Seanan McGuire (book review). The Brightest Fell (October Daye book 13) by Seanan McGuire (book review). Once a series of books has gone well past the trilogy that the author probably originally envisaged there is an issue with finding ways for the new reader to find out what is happening and what relevant aspects there are from previous novels that the reader needs to know. ‘The Brightest Fell’ is the thirteenth in the series featuring October Daye. The background was filled in enough, almost as if expecting readers unfamiliar with the characters and setting. Those already familiar with them might find the repetition of things they already know slightly annoying. October or Toby, as she is called, is a changeling. In this context it means that she is half-human. Her mother is fae. When she was old enough, she had a choice to be human or fae. She chose to be both but, over the series, her human side has been eroding and she has taken on more of the characteristics of her mother’s race. People come to her when they have an insolvable problem. As this volume begins, Toby is attending her bachelorette party or hen-night at a karaoke bar. She is planning to wed Tybalt, King of Cats, sometime soon but a date not actually set. For once, she is able to relax and enjoy herself. That feeling of well-being lasts until she gets home when an unexpected and unwelcome visitor arrives, her mother, Amandine. The relationship between Toby and her mother is fraught. To say they dislike each other is putting it mildly. Amandine is full fae and one of the Firstborn, also called the children of Oberon. She has decided that Toby is to find her sister, August, who disappeared more than a hundred years ago. Toby’s instinct is to say no. That angers Amandine who is not used to having her will thwarted. She turns Tybalt into a cat and Jazz, the girlfriend of Toby’s Fetch (a complication from an earlier novel) into a raven before imprisoning them in small, thorny cages. She tells Toby that they will only be released when August returns. One of Toby’s skills is to be able to follow magical scent trails however old they are, but she need somewhere to start if she is to release the captives. The person who will know August best is her father, Simon. He, however, was elf-shot and rendered sleeping for a century due to crimes committed in previous novels, among which was trying to kill Toby. He is not an ally she is willing to trust totally but reckons he will want to help find his daughter. She has him awoken and, indeed, with his help she finds the beginning of the trail that they hope will lead to the missing fae. Since the magic of every person smells differently to Toby, it seems reasonable that she can follow a scent trail. The improbability of doing so after a hundred years is more problematic. It is a convenient device designed to hurry the plot along. Toby is set to face many tribulations during the course of her search and those who love the series will overlook the shortcomings. There is nothing wrong with the scenario that sets up the action but some of the aspects do appear a little too convenient. The book also contains a novella, “Of Things Unknown”. This is set in the same universe but mostly involves different characters, though Toby does appear towards the end. This novella involves April O’Leary, a character first met in ‘A Local Habitation’, the second of the ‘October Daye’ series of novels. April is a dryad who has lost her tree and exists mostly in electronic form, though she can become corporeal. One of her mothers, January O’Leary, died in events that also claimed the lives of several friends. There is a way to restore them to life but April won’t allow that unless January is included in the process. That leaves a problem, January’s body was destroyed, so April needs to strike a bargain to get her a new one. This story is much more logical than the main novel even though there are some aspects that are not easy to decipher. Both novel and novella will be welcomed by fans of this series. Although not necessary for the understanding of the events, it is probably better to start at the beginning so that the characters have a better chance of life. « Daredevil Season 3 featurette examines Wilson Fisk’s return.